Is The Anger Towards President Obama's Vacations Justified? President Obama is vacationing while the world burns. How could he? With the midterm elections approaching, many Republicans have attacked the President in recent months, asking how the leader of the free world could possibly enjoy a round of golf while multiple regions of the world are currently in turmoil. Ukraine, Gaza Strip, Iraq - the list of areas of the world that are currently embroiled in combat seems to be growing by the day. 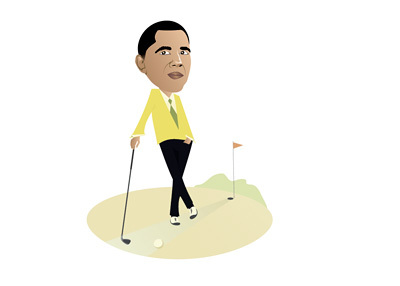 President Obama has taken particularly strong criticism due to his recent golfing excursions. The anger towards him was ratcheted even higher this week after he was photographed playing a round of golf on Martha's Vineyard. The outing was seen as being in particularly poor taste to some due to the close proximity to the recent events in Iraq involving American journalist James Foley. Obama's critics have seized on his golf outings - shouldn't he be back at the White House, they ask? Shouldn't he be sitting in his White House office, sleeves rolled up, working hard on the problems that currently plague the world? President Obama's supporters will argue that the President has taken just a fraction of the vacation days that his predecessor, George W. Bush, took. According to NYDailyNews.com, George W. Bush had taken 381 partial or complete days at his ranch in Crawford, Texas, and an additional 26 days at his compound in Kennebunkport, Maine at this point of his Presidency. President Obama, on the other hand, has taken 138 full or partial days of vacations since the start of his first term in office. NYDailyNews.com goes on to say that President Clinton took 174 partial or full days of vacation while in office, while Ronald Reagan took 349 full or partial days of vacation. President Obama's supporters: President Obama has taken just a fraction of the vacation days that President Bush or President Reagan took, so back off. 1) President Obama's vacations, including trips to Hawaii and Martha's Vineyard, have been much more expensive (for the taxpayer) and opulent than his predecessors' vacations. George W. Bush, for instance, would largely remain out of sight on his ranch in Crawford, preferring to spend his days mountain biking or running on his ranch. 2) President Obama's timing, in the eyes of many, is very suspect. With conflicts currently raging in Ukraine, Iraq and the Gaza Strip, many people feel that the leader of the free world should be trying his best to broker peace instead of playing golf. What do you think? Is too much being made about President Obama's vacationing tendencies or do his detractors have a point?